The Fallkniven A1 is one of the best fixed blade knives on the market today. 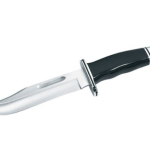 A fixed blade knife is one that has the blade permanently affixed to the handle and doesn’t move. 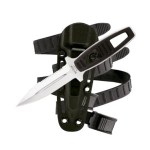 This is in contrast to a folding knife where the blade folds down into the handle. 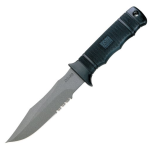 Fixed blade knives have a wide range of applications and are popular for use as hunting knives and survival knives. They are extremely sturdy and strong, making them especially well suited for tasks that require force. 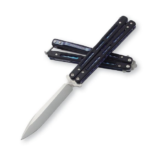 They are also reliable in that the user will never have to worry about a fixed blade knife not opening properly or closing accidentally while being used. The rest of this guide is dedicated to helping you find the best possible fixed blade knife to help you in your everyday tasks! These knives are used to skin and dress animals. Typically, hunting knives will have either a clip point or drop point and may be serrated for heavy duty butchering tasks like cutting through bone. There are different types of hunting knives for different sized projects. Splitting the chest cavity an elk open requires a different blade than cutting up a grouse leg. Survival knives are general-purpose fixed blade knives that can be used in a camping or survival situation; it may serve as a hunting knife, cooking knife or machete. 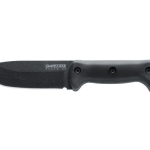 These knives have to be extremely rugged but are less geared towards any one task. Knives for cooking are the most familiar types of fixed blade knives. These knives are designed for various cooking tasks and therefore must be both comfortable to use as well as versatile. A general purpose survival knife should also be functional for cooking-related tasks like slicing and chopping. Throwing knives are designed and constructed to be thrown for sport or for self-defense. They are usually made of steel to make them better able to withstand repeated impacts with hard surfaces. Knives that are deemed collectible tend to be ones that have unique and visually appealing characteristics. They are often purely decorative and therefore may not be designed or constructed for practical use. Fixed blade knives consist of a handle and a blade. Knowing how to evaluate the different handle and blade materials is essential for selecting a good general-purpose fixed blade knife. Bone, leather and wood are popular choices for knife handles. They are all soft enough that a monogram or logo can be easily engraved and these materials can all be aesthetically pleasing. Natural materials are not the most long-lasting options for a knife handle, but they can be comfortable and add to the knife’s aesthetic appeal. Materials like steel and aluminum are resistant to the effects of weather. Aluminum handles are also resistant to the wear and moisture. Plastics can be extremely durable while also being lightweight and comfortable to hold. With quality knives, the blade tang will extend though the injection molded handle to make the knife stronger and to provide a hitting surface at the bottom of the handle. These handles can be made slip resistant so that they are easy to hold when wet. The shape of the blade is what determines a knife’s function, whether that purpose is to slice tomatoes or to clean fish. The edge is the most important part of the blade as this determines what the knife may be used to cut. Blades on general purpose fixed blade knives should be made of a material that allows them to hold an edge even when used to cut harder materials. Serrated edges are useful for sawing through wood and other dense materials while a smooth edge is able to make clean cuts through most materials. For outdoor use, 1095 carbon steel is generally considered a good material for knife blades and is popular with users of survival knives. It is strong and can retain an edge even with rough use. The purpose of this knife is more general than a standard survival knife; the blade is AUS8 stainless steel and not carbon steel for one thing. It is not necessarily the best knife to use extensively for every type of survival situation; however, such situations are often unpredictable and SOG Seal Pup Elite can still be an effective tool for someone who has no other options. The Seal Pup Elite is powder coated, not painted; this finish is longer lasting and less likely to wear. 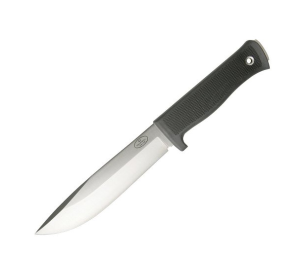 The overall length is 9.5 inches with the blade alone measuring 4.85 inches. It weighs a mere 5.4 ounces which is important. Ease of carrying the knife is a big factor in how useful it is. For long hikes where every ounce matters, a lighter fixed blade knife is far more useful than a large heavy one. The handle is made of a material called Zytel that has been reinforced with glass. It is textured and has four finger grooves. There is a lanyard hole that may be of value to some users depending on how they want to carry the knife. This knife may be used for a wide variety of camp chores including brush-clearing and chopping firewood. It is designed for heavy-duty outdoor use and is made from 65mn steel, which is equivalent to 1065 carbon steel. While 1065 steel is not as hard as 1095 steel, it is still hard enough to handle most camping and survival-related chores. The relative softness of the material makes it easy to sharpen. The Camp 10 has good cutting power due in part to its curved design. The blade is powder coated to make it corrosion resistant. The overall length of the knife is 16 inches with the blade measuring 10 inches. Both the length and material of the blade give it the leverage needed for chopping hard materials like wood. It weighs 1 lb 3 ounces. The handle is made of Kraton rubber ergonomically designed so that it is comfortable to hold for extended periods. It has a full tang design to make it stronger and to give it better balance. The drop point on this knife adds to its strength and ability to penetrate. This knife comes from the factory with an exceptionally sharp edge and can handle chopping wood with ease. While it may not handle wood the way a good machete can, it can still do an excellent job for a knife of its size. The blade is laminated and consists of a VG10 core with a 420J cladding. While this material is considered more brittle than 1095 steel, it will still hold up to most jobs the average user will throw at it. The overall length is 11 inches with a blade that measures 6.3 inches. The A1 weighs 12 ounces. The Fallkniven A1 has a full tang design with the tang running all the way through a handle made of Kraton rubber. The Kraton rubber provides a slip resistant surface and there is texturing to enhance the grip. The rubber makes it comfortable to hold and helps to dull the shock from constant chopping.